Arianespace have launched their Soyuz ST-A from the European Spaceport “Centre Spatial Guyanais (CSG)” in Kourou, French Guiana. The veteran rocket successfully launched Pleiades, SSOT and four Elisa satellites into a Sun synchronous orbit, with launch occurring at the opening of the launch window at 02:03 GMT on Friday morning. This was the second Soyuz to launch from the newly constructed launch site at Kourou, following the successful mission to loft two European “Galileo” navigation satellites into orbit via the Soyuz ST-B. The Soyuz-2 forms the basis for the Soyuz-ST rocket, which has been optimised to fly from Kourou, and also incorporates a flight termination system and a modified telemetry system. 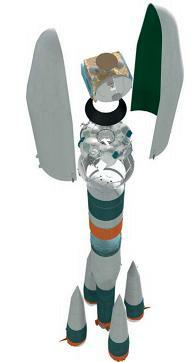 The vehicle consists of four boosters (first stage), a central core (second stage), a third stage, and the restartable Fregat upper stage (fourth stage). Each vehicle also includes a payload adapter/dispenser and fairing. The inaugural flight of the upgraded Soyuz 2-1b launch vehicle was successfully performed on December 27, 2006, launching the Corot scientific spacecraft for the French Centre National d’Etudes Spatiales. 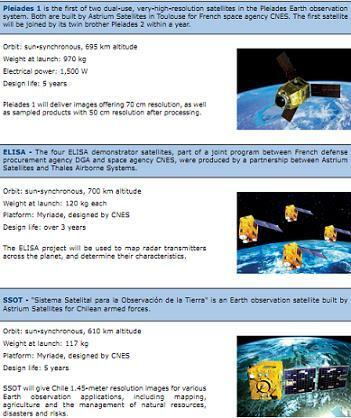 For this Soyuz – designated VS02 in Arianespace’s launcher family numbering sequence – the mixed payload consisted of France’s Pléiades 1 and the Chilean SSOT satellites for civilian and defense image gathering, along with four French ELISA micro-satellite demonstrators for defense-related electronic intelligence gathering (ELINT). Pléiades 1 was deployed 55 minutes after Soyuz’ liftoff, followed four minutes later by the simultaneous release of all ELISA satellites. Completing the mission was the separation of SSOT, which occurred 3 hours, 26 minutes after liftoff. France’s 970-kg Pléiades 1 dual-use imaging satellite and the 117-kg Chilean SSOT multi-role observation spacecraft, along with a cluster of four French ELISA demonstrator satellites for defense-related electronic intelligence gathering (ELINT), which weigh 120 kg each, marked a complicated mission profile for Arianespace. These payloads were released into Sun-synchronous orbits in a multi-step process during the flight, involving the Soyuz’ Fregat upper stage carrying four propulsion burns, with a fifth to deorbit the stage. The mission was Arianespace’s year-ending flight at the Spaceport, and comes less than two months after the company’s historic maiden launch of Soyuz from French Guiana in October. Also scheduled in 2011 is another Soyuz launch at Baikonur Cosmodrome with six Globalstar second-generation satellites, which is scheduled during the week of December 25 and will be conducted on behalf of Arianespace by its Starsem affiliate. To date, Arianespace has logged seven missions in 2011. The five flights with its heavy-lift Ariane 5 during the year orbited eight telecommunications satellites (Arabsat-5C, ASTRA 1N, BSAT-3c/JCSAT-110R, GSAT-8, Intelsat New Dawn, SES-2, ST-2 and Yahsat Y1A), along with an Automated Transfer Vehicle for servicing of the International Space Station. The other two launches were Soyuz missions, one operating from Baikonur Cosmodrome with six of the Globalstar second-generation satellites, and Arianespace’s maiden flight of Soyuz from the Spaceport, which lofted two Galileo IOV (In-Orbit Validation) navigation satellites.